If you're looking for a traditional fireplace, then you should stop reading right now. 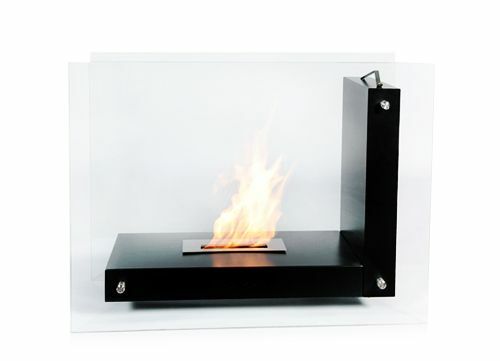 But, if you're interested in creating a totally unique and modern hearth, you might want to take a closer look at this Bio Flame Allure See-Through Fireplace. Defined by bold, clean lines and stark contrasts, this fireplace makes a sophisticated statement capable of enhancing any room. And we mean that literally. Because this Bio Fuel fireplace requires no venting, your placement options are almost limitless and you even have the ability to move your hearth should the situation call for it. Need to set the mood for a dinner party and an evening of relaxation in the den with friends? Not a problem with this convenient appliance. However, that is not to say that a striking appearance and extreme versatility are the only things that separate the Bio Flame Allure See-Through Fireplace from its competitors. Most gel fireplaces use fuel made with synthetic compounds that produce undesirable and potentially dangerous by-products when they burn, but not the Allure. Fed by Bio Fuel, a substance derived from crops like corn and sugar cane, this fireplace's flames are completely eco-friendly. You won't find any smoke, hazardous gases, or foul odors - just comforting natural heat. And that's healthier for your guests as well as the local flora and fauna. Everyone's tastes are different. And now, thanks to the Bio Flame Allure See-Through Fireplace, those of us who want a cleaner and more contemporary hearth no longer have to settle for products that don't meet our needs. There's simply no better choice for the environmentally-conscious consumer.